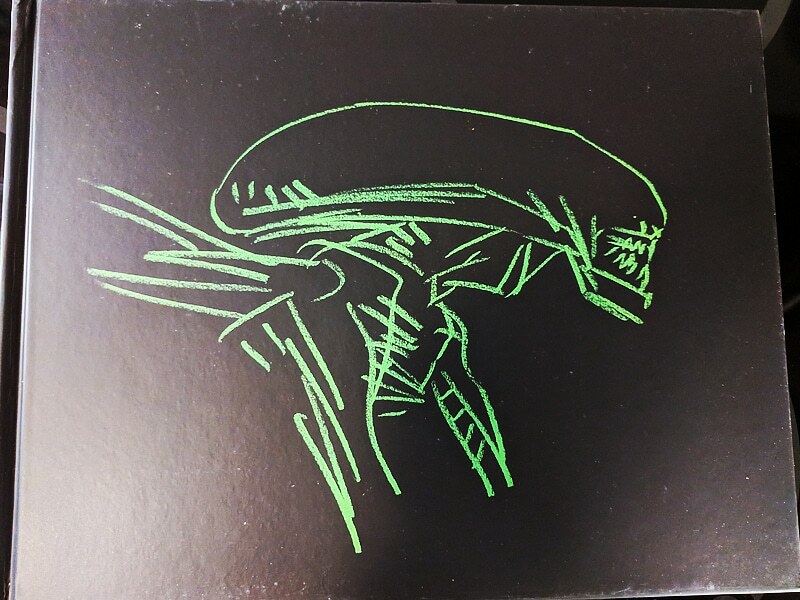 I don’t usually play horror games but being a fan of the Alien franchise, I couldn’t pass up the opportunity to play Alien: Isolation. I thoroughly enjoyed the game, I played it twice so far, once on Xbox One and once on the PC. 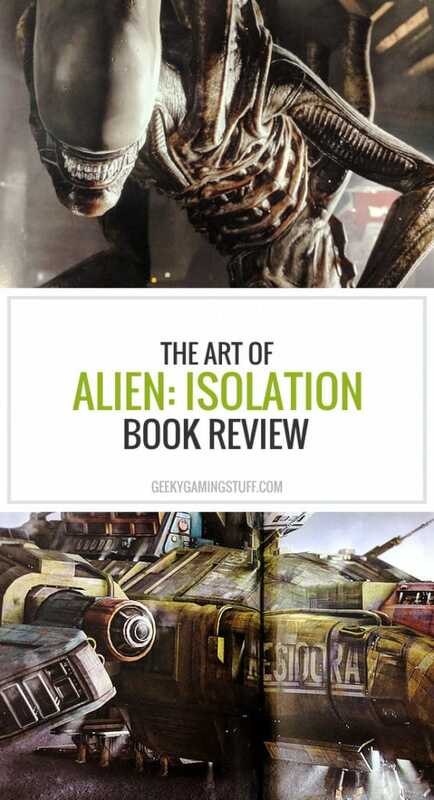 A couple of years ago I was gifted the book The Art of Alien: Isolation for Christmas, so I decided to write up a little review for it. 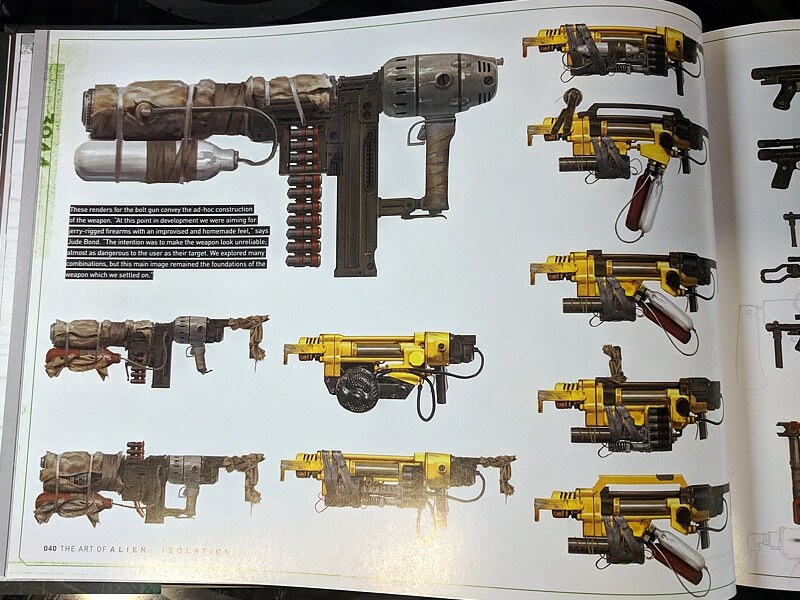 The book is a little bit larger than a standard A4 and it opens up horizontally instead of vertically. 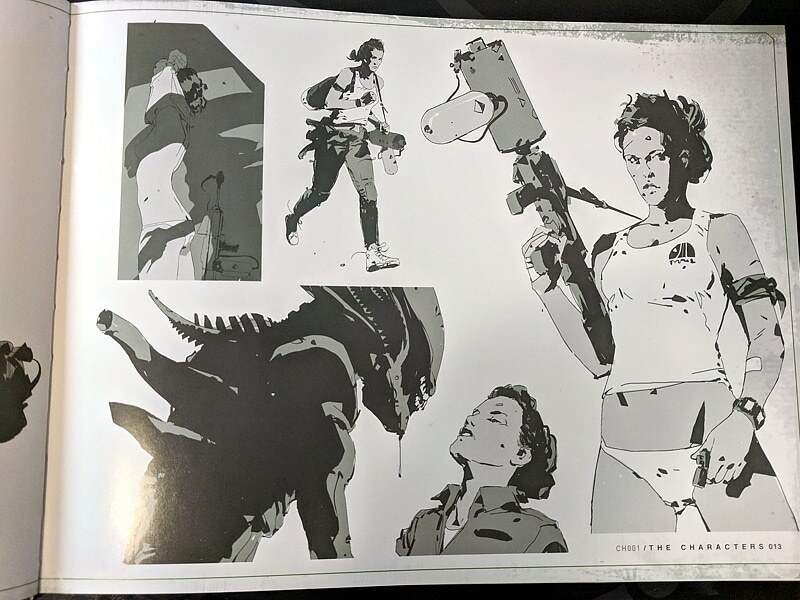 The detachable jacket features the Sevastopol station on the front and the Xenomorph on the back. 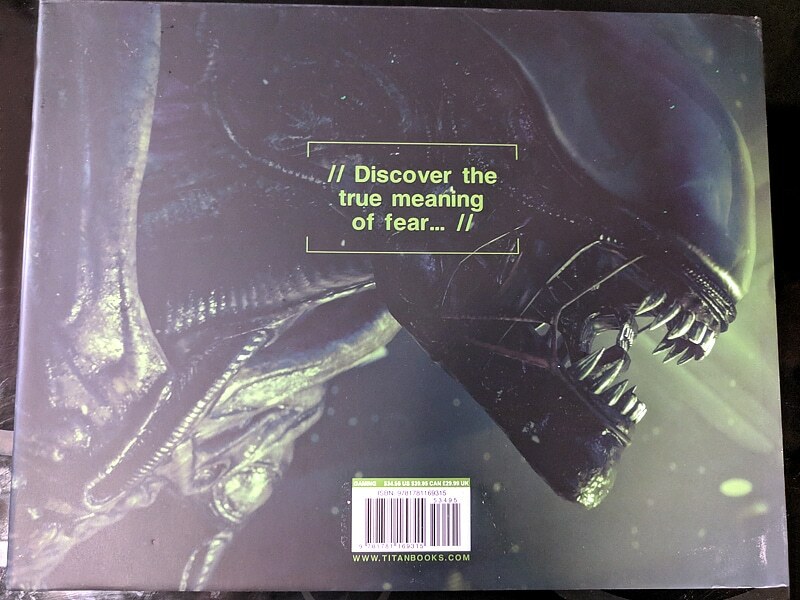 The bright green parts of the image are in glossy finish as well as the name of the game (both in front and on the spine). 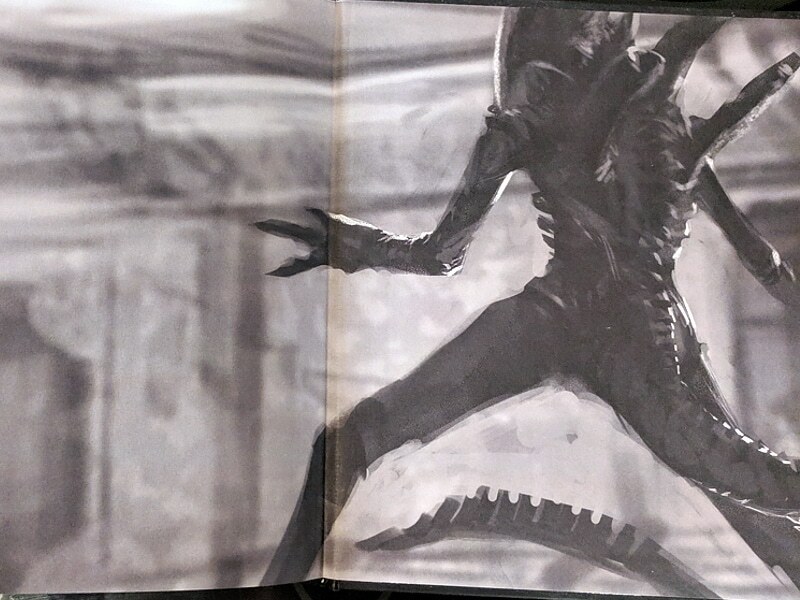 Under the jacket the book hard cover is black with a green rough pencil sketch of the Xenomorph on the front. Click on the thumbnails below to see bigger photos! 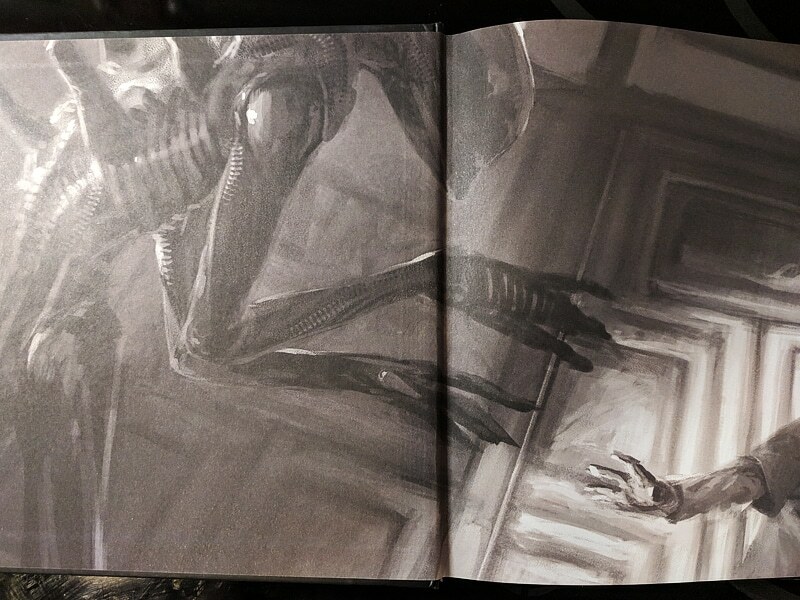 From the very first page when you open the book, you can see a black & white concept art of the Xenomorph in various scenes (both front and back inside cover) and from then on, there’s so many beautiful art and screenshots from Alien: Isolation as well as interesting facts about the production of the game. The pages are thick and glossy and it’s a joy to browse through it. 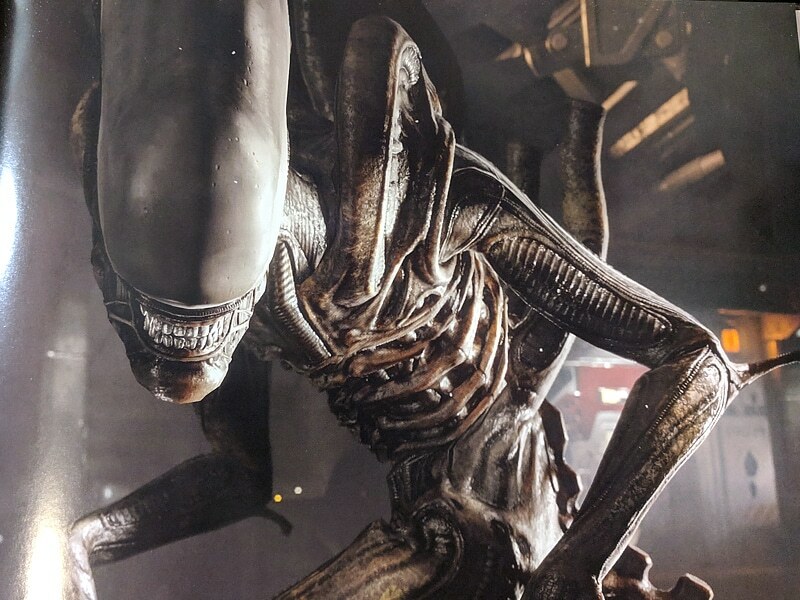 I think any fan of the Alien franchise would love it. 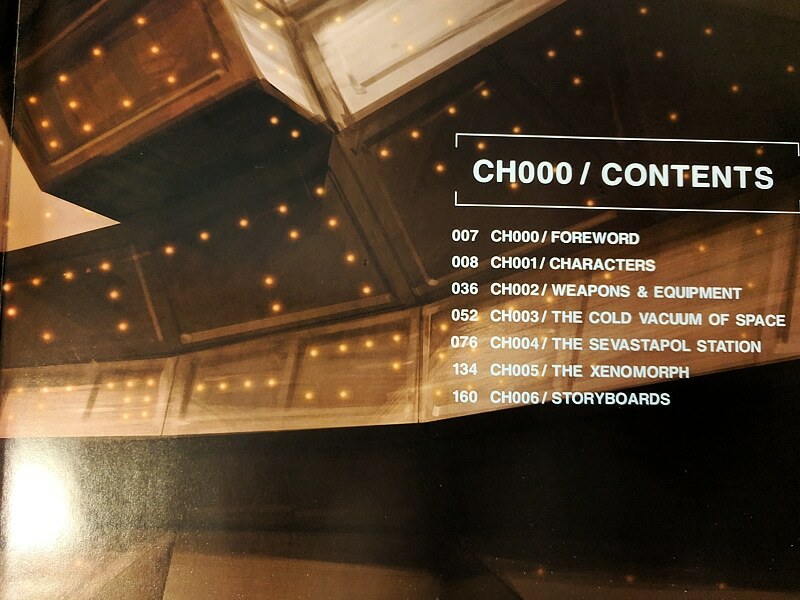 After a brief foreword from the game’s lead artists Jude Bond the book is split up into 6 chapters. 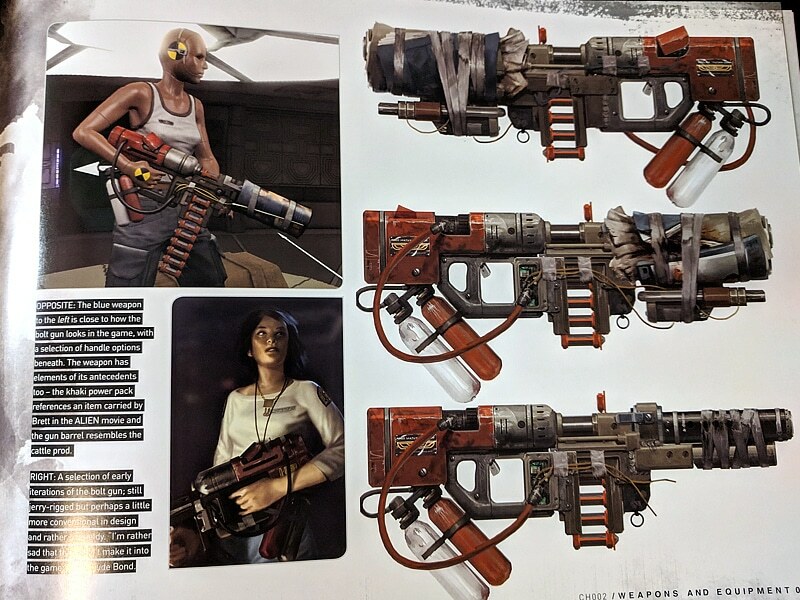 Please be aware that some of the images below might contain spoilers for the game if you haven’t played it yet. I won’t be including every single detail from the book, so you can enjoy it yourself. 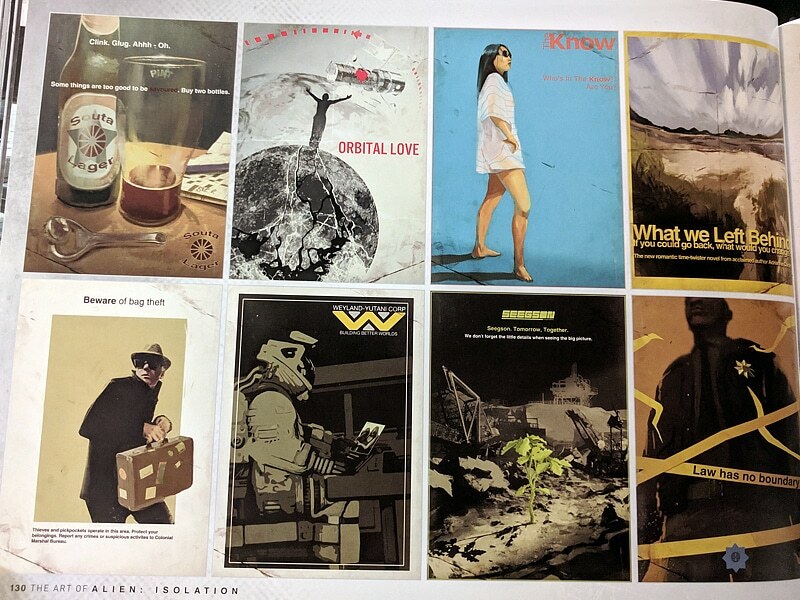 I’ll just pick some information that I find interesting and of course I’ll share some beautiful artwork to go with it. The first chapter deals with the creation of the main characters. 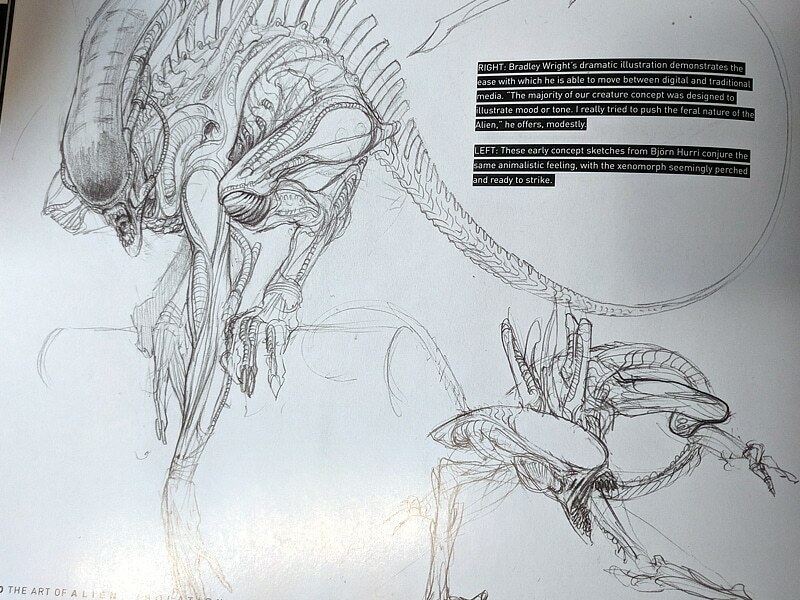 The developers wanted to create them to be believable and also to fit into the original movies. 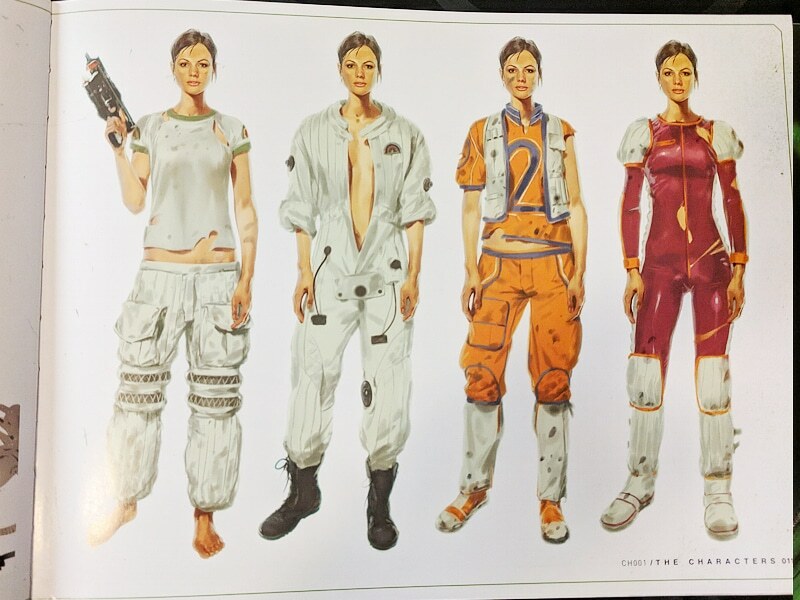 The clothing worn by the characters were designed to closely follow the work of the original movie costume designer John Mollo and artist Jean Giraud and thanks to this Alien: Isolation feels like an extension of the Alien franchise. 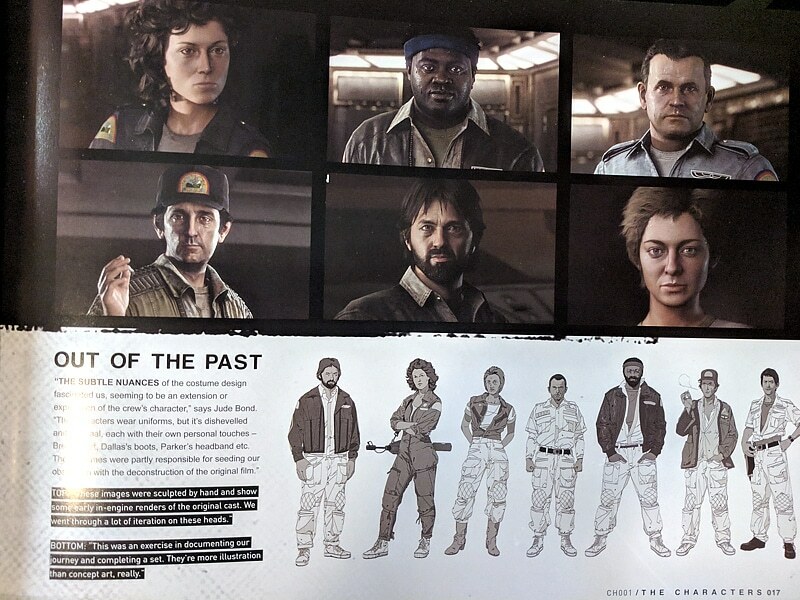 Following the idea of the uniforms having personal touch from the original movie, the game designers added a variety of styles to show a bit of people’s character as well. 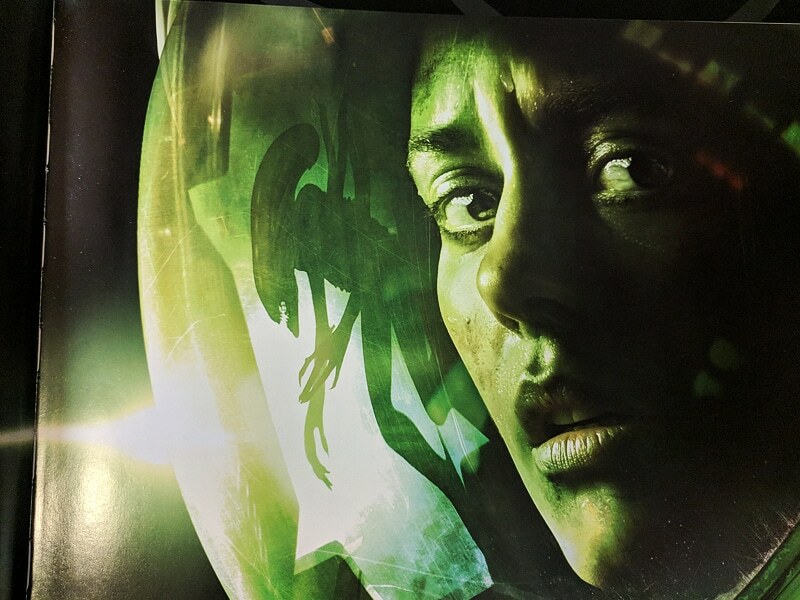 If you’ve played Alien: Isolation before, you know that using any kind of weapons can turn deadly quickly, so it’s usually better to create diversions and run away than to risk alerting enemies or the Xenomorph itself. 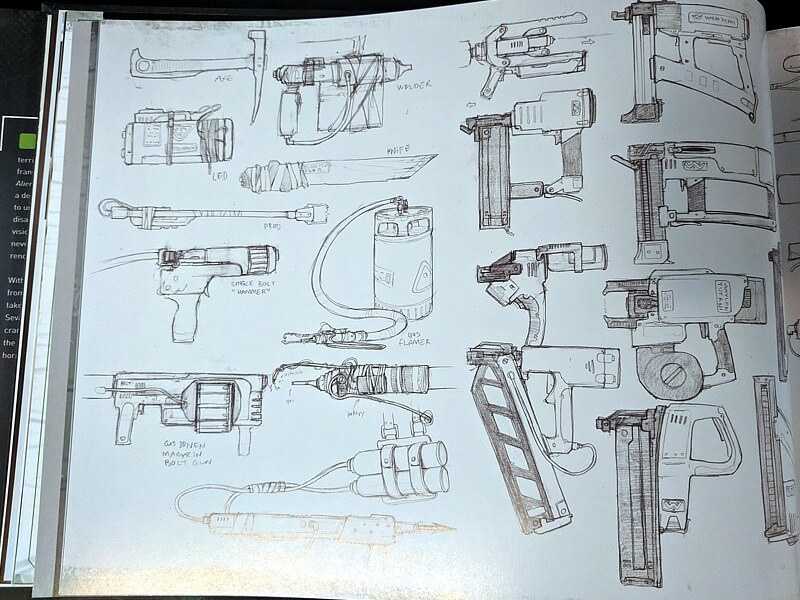 The weapons were initially planned to be crafted but the crafting component was later scaled back, so in the game you can make only a few tools to help you fight/survive. 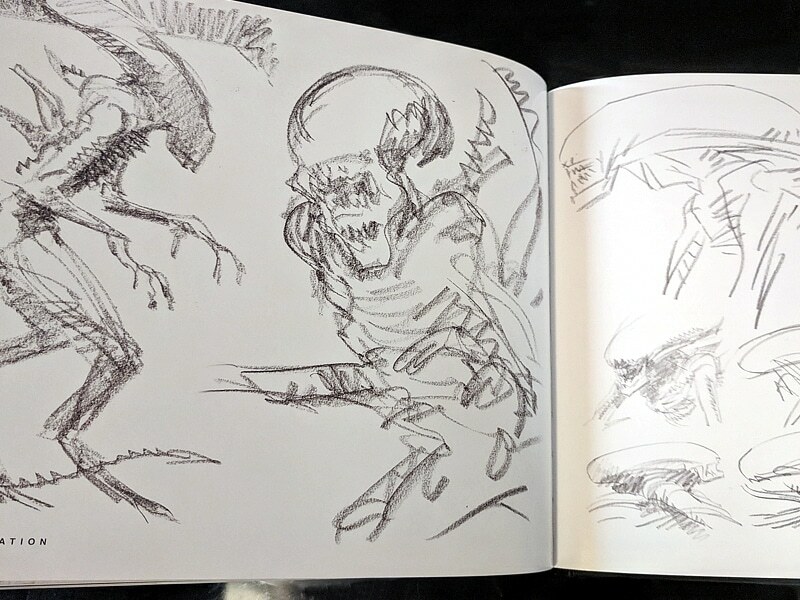 Some of the vessels’ concept art has been based on unused production materials from the Alien franchise but the artists also drew their inspiration in modern references, for example NASA Apollo missions. 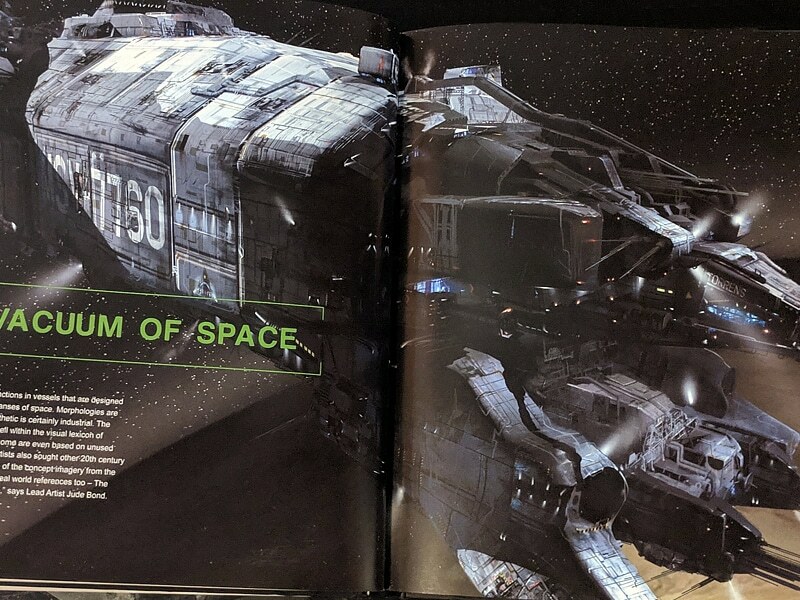 This section of the book has numerous drawings, sketches, concept art and renders of various ships (and their interiors) like The Anesidora 88-LS, USCSS Nostromo, medical transport vessel PATNA B4LS004 and, of course, The Torrens MSV 7760 itself. 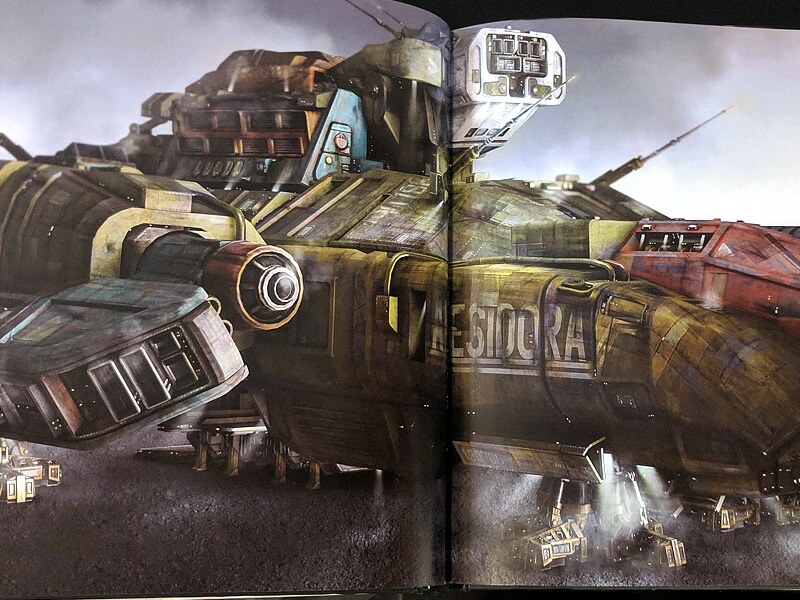 The Sevastopol Station was inspired by the ore refinery from the first Alien movie. 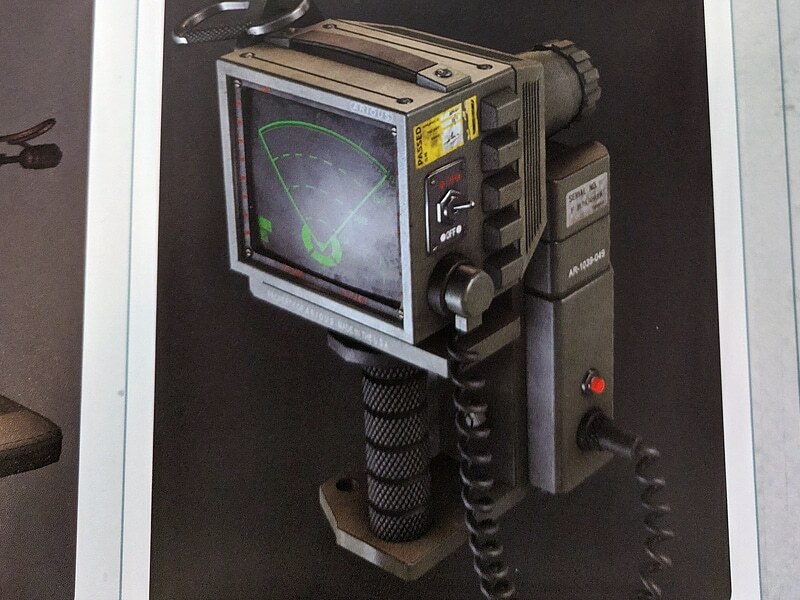 To make sure the aesthetic of the interiors fit within the franchise, the team focused on building things and equipment from materials that would have been available in 1979. 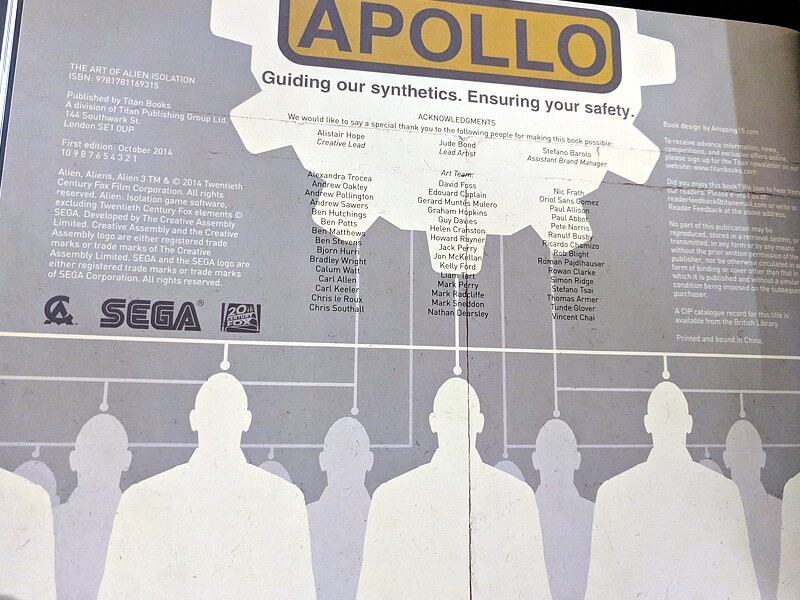 The team also made hundreds of background details like the posters above, using styles and colors from print materials from the 1970s. 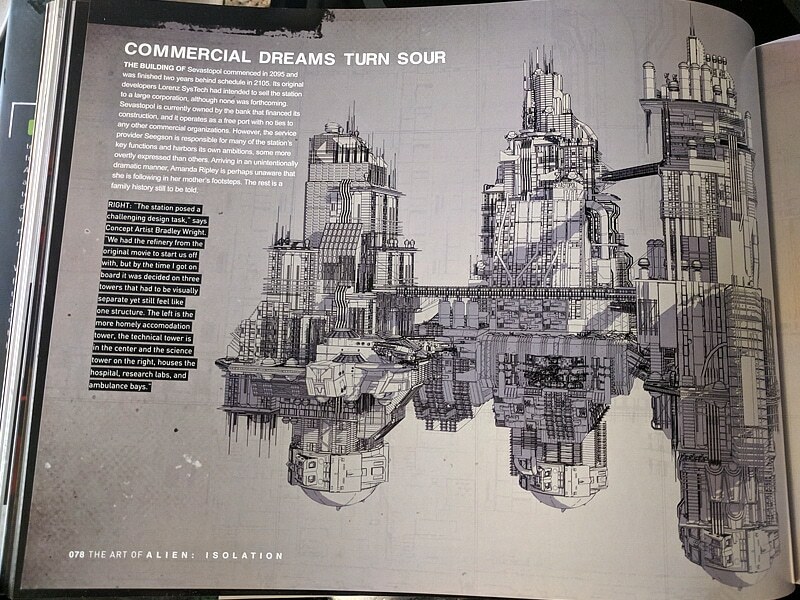 This section beautifully illustrates the inside and outside of the station, with details I haven’t noticed in the game as well as some interesting information about the ideas for certain features. 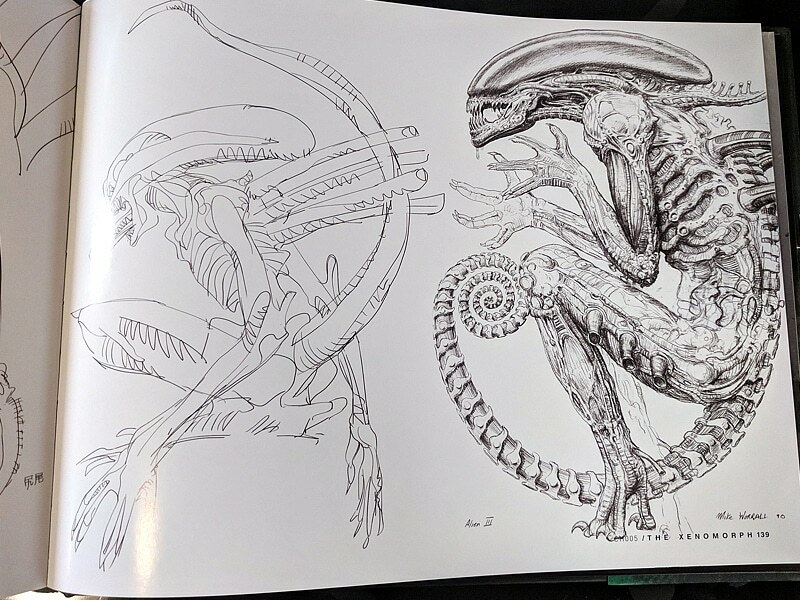 The Xenomorph section of the book details rough pencil sketches of the creature and also features some artwork from H. R. Giger and Mike Worrall. 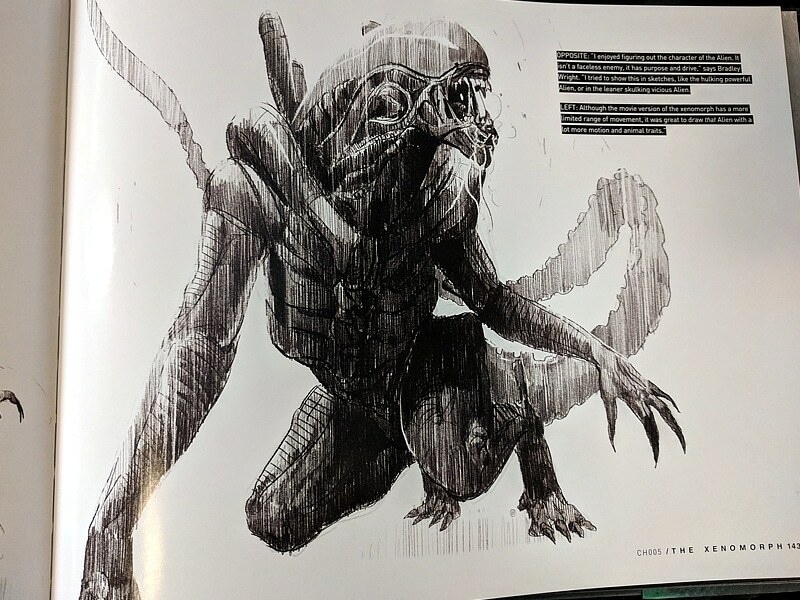 This chapter also touches upon the design of the alien hive on Sevastopol. 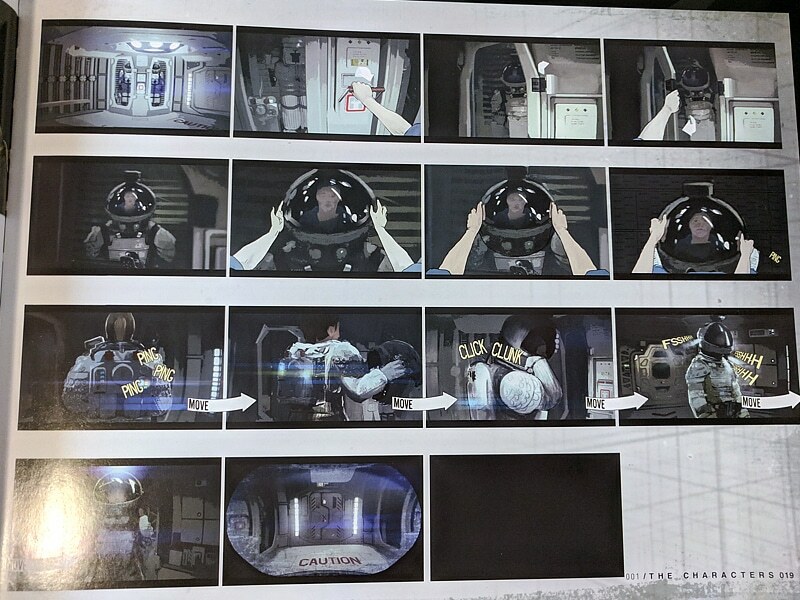 The storyboards section describes how vital they are in the development of the game as a quick concept of the gameplay before it’s put into digital form. 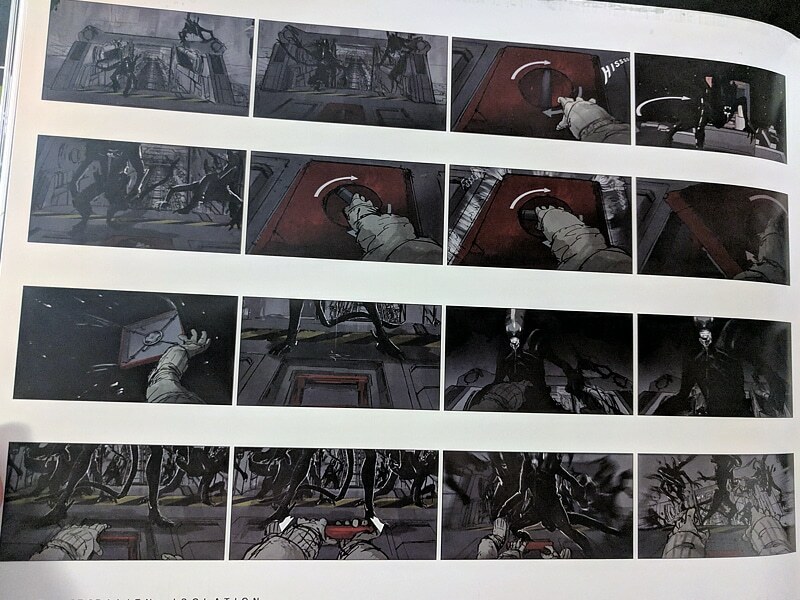 Some might not have been used in game but they only needed to convey the feelings of dread and panic. 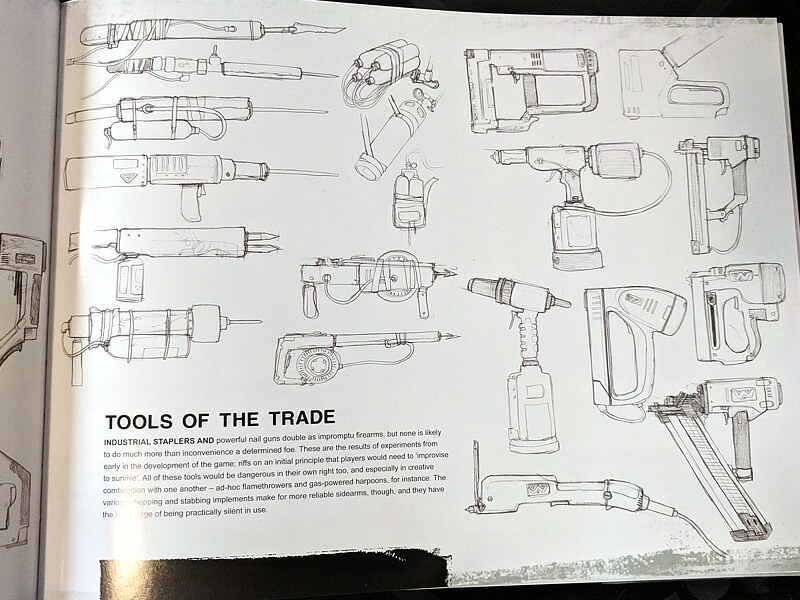 The Art of Alien: Isolation book is obviously packed with beautiful concept art from the game and full of interesting facts of the game’s production. 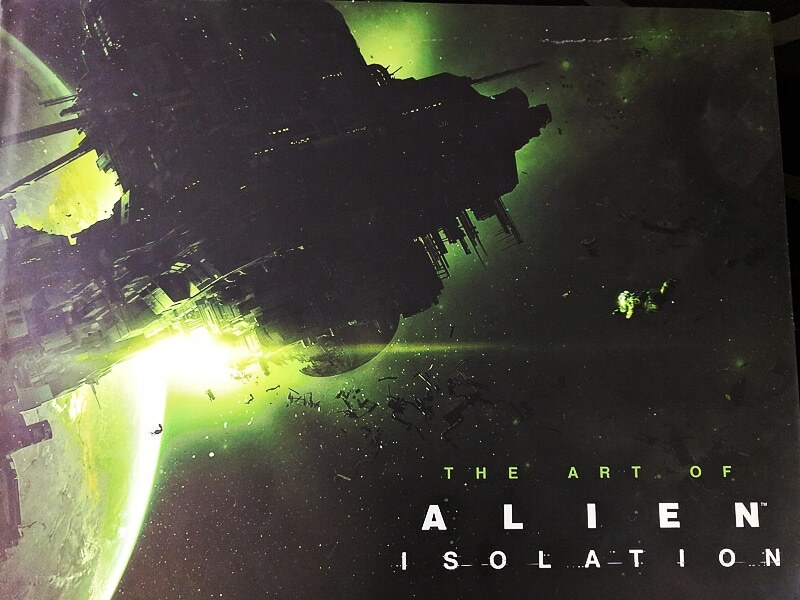 It was interesting to read about the influence of the movie franchise on the game and the team’s dedication to seamlessly integrate the game into the Alien universe. 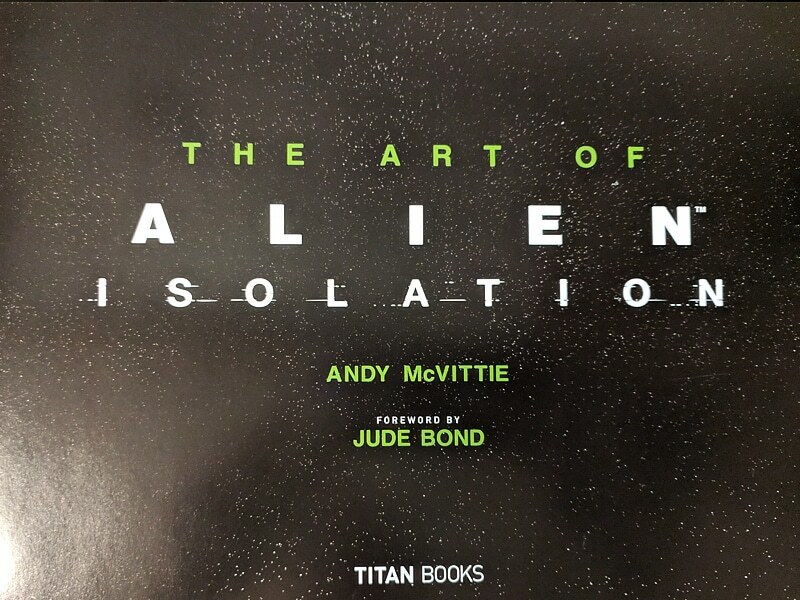 I definitely recommend this book, it’s a perfect idea for a gift for someone who loves the game and the Alien franchise. You can get the book on Amazon. Make sure to also check out my other reviews for other art books! I hope you enjoyed this review! If you have any questions about the book please don’t hesitate to ask!